You are probably as excited as I am…but pumpkin season is HERE. So is slipper season. And apple cider season. And cuddle-under-a-blanket season. I am ready for these cool mornings, golden leaves and warm colors. Annnnnd pureed pumpkin! I opened up my first can last weekend and it immediately became autumn in my mind. I decided to create a snack cake that is loosely based on my recipe for this banana breakfast cake. I have been doing a lot of cooking and baking with yogurt lately and I though that the creaminess and tang would be a perfect addition here. It made an incredibly moist cake that would be perfect for dessert, a snack or breakfast. It wasn’t very sweet, but tasted just like pumpkin pie! Not to mention that our whole loft smelled like fall. All I have to say is bring it on! A quick fall recipe for pureed pumpkin. 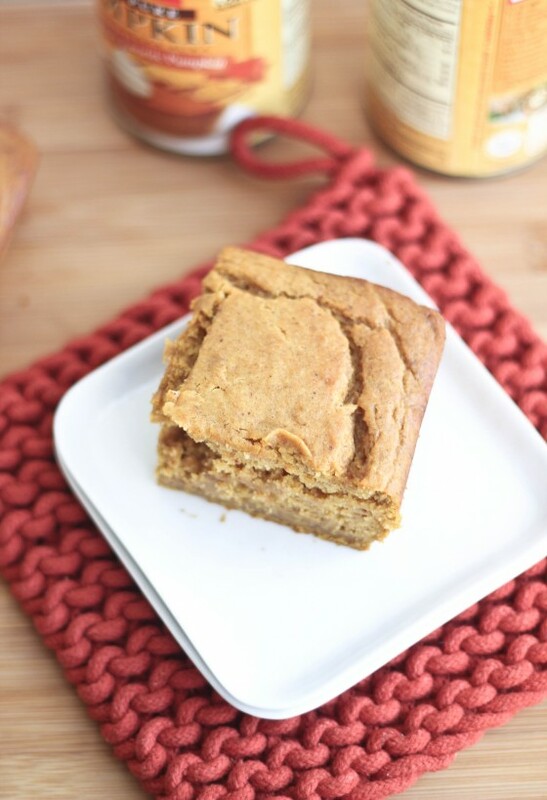 Pumpkin pie spice, brown sugar and vanilla yogurt create an easy cake for breakfast, dessert or a fun snack. Preheat oven to 325 degrees. Grease a 9x9 baking dish. In a small bowl, combine the flour, baking powder, pumpkin pie spice, cinnamon and salt and mix well. In a large bowl, whisk the grapeseed oil and sugar until combined. Add the eggs, yogurt, vanilla and pumpkin and mix until fully incorporated. Add in the flour mixture and stir to incorporate the dry ingredients. Pour the batter into the prepared pan and bake for 40-50 minutes until a toothpick inserted comes out clean. Also, I know this recipe has nothing to do with apples but this week, two lovely ladies have been hosting a week-long apple event and today they are hosting a blog hop and round up of all things apple! 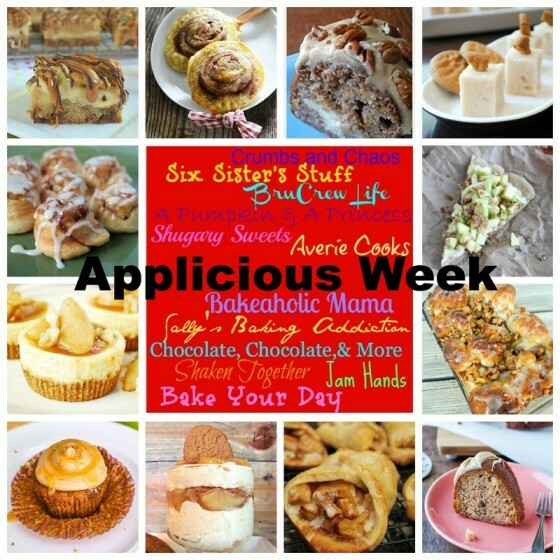 Here is a list of all of the ladies participating and their amazing apple recipes! This looks so moist and perfect! Yum! I love using the term “snack” and “cake” together because it makes me feel like I can eat it whenever – like 10 a.m. Because having a snack at 10 a.m. is totally appropriate. Fall flavors make me dizzy with excitement! Yay for pumpkin snacks! I have to say that pumpkin treats are my absolute favorite Fall treats. (don’t tell the apples:-) And this cake looks like the perfect wake up to on Saturday kind of cake. Love it!!! I love it anytime you can put the words “snack” and “cake” in the sentence. Makes it a good day. This looks and sounds awesome! Great photos! I really need to jump into the pumpkin bandwagon. This snack cake sound amazing Cassie! I love a house that smells like fall and pumpkin and cake! YUM! Cake for breakfast!? I’m totally in! Cassie, can I come and live in your kitchen?! I love the term snack cake. I also love pumpkin and yogurt, can this snack cake get any more perfect??? I want a slice of this right now!! That would be so fantastic with my cappuccino this morning. Is there anything I could substitute the grapeseed oil for? I don’t have it on hand, and last time I looked at it, it was awfully pricey. Hi Liz, yes, absolutely! You can use canola or vegetable oil in place of the grapeseed. I just prefer the grapeseed in baked goods, but it won’t make a huge difference at all! Yogurt just wonders, doesn’t it?! This cake looks so tasty! I broke out the pumpkin this week too. It is time! 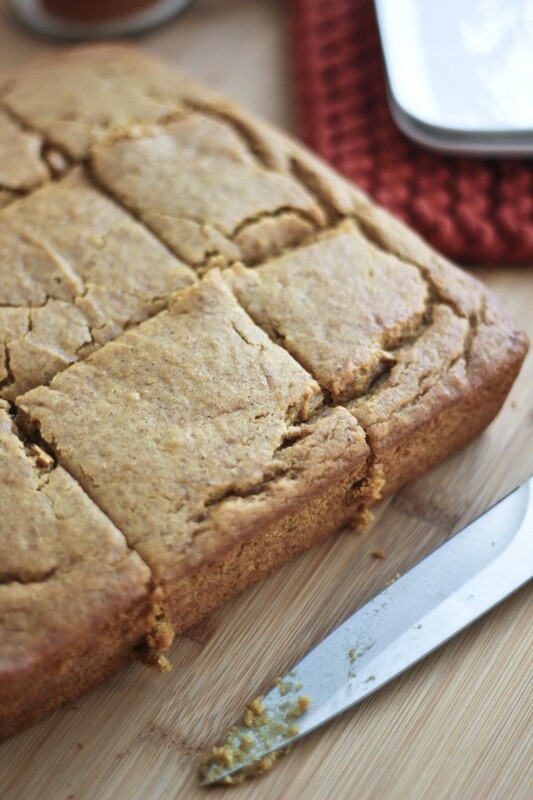 This looks delicious and is totally getting me in the mood for pumpkin recipes! I haven’t broke open a can of pumpkin yet, but this cake has reminded me that I need to get on that! I’ve been baking with yogurt a lot lately too, so this recipe is right up my alley. Snack Cake. Love it. Cause then I can snack on it all day long….Looks delicious! Yay for pumpkin season! Snack cake sounds acceptable for breakfast, an afternoon snack, or an after dinner treat – I like the way you think :). I know what I’ll be snacking on this weekend, this! Love everything about it! Actually the kiddos are napping so I just may need to make this now! Great recipe, Cassie! Cassie, I just LOVE your blog!! I’m in such a pumpkin mood and this looks like exactly what I want to bake next. I <3 baking with yogurt! So simple and delicious–this is perfect for fall! Love this cake, Cassie! Snack cake is a personal fave of mine and, between the pumpkin and yogurt, I bet the texture of this one is off the chizzity. Thanks for another great recipe!! So many pumpkin recipes to try and not enough time. This cake looks so moist, and I love that you named it a snacking cake. I could snack on this cake all day, munching a piece here and tearing off a corner there. It looks delicious. This looks so delicious, I love that it’s not too sweet and so is perfect for any time of day! adding this to my list of must-make pumpkin recipes!! It looks so moist! And I love how simple it looks. I don’t normally like fussy things. And for fall? No. No fussy stuff! If I made this for breakfast, it would be gone by dinner! Yum! I am more than thrilled that pumpkin season is here! And you know I’m going to make this “snack” cake and then “snack” the entire pan! Oh Cassie, I want this for breakfast! There’s nothing better than a cake that’s made for snacking 😉 Happy weekend! Cassie this looks amazing. I love pumpkin recipes so much!!! I love the term snack cake. That means I can eat it at any time of day, right? Even though it doesn’t really cool off here, I start needing fall flavors September 1st anyway. It must be some sort of biological clock. I can’t wait to try this out. Hi! This looks amazing! ! Could I sub coconut oil for the grapeseed oil? That’s what I have on hand. Ohhh, I’m thinking a few chocolate chips wouldn’t hurt either, right? 😉 Thank you! ! Great linkup of recipes and you cake looks sooo moist and yummy! Would love a piece of this right now! Sounds just incredible. It’s still a gazillion degrees where I am, but I’m so ready for pumpkin season! Yeah! Its my favorite time of year 🙂 The only time I’m ever homesick for a season change. Love what you whipped up with your first pumpkin puree can of fall! This is such a perfect treat to welcome the Fall! Yes, I can’t wait to get cooler temperatures and enjoy more pumpkin and apple desserts. 🙂 I love cinnamon and spices. Just opened my first can of pumpkin last night! And this little snacky cake is riiiight up my ally. 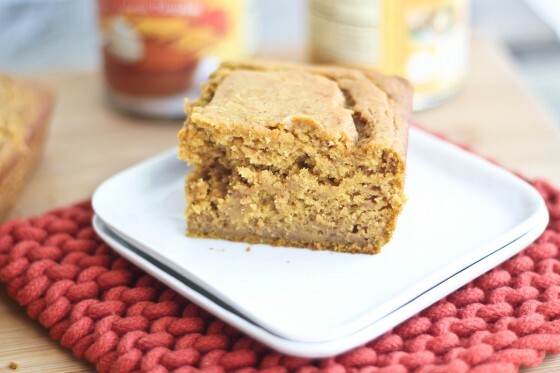 I am ready for pumpkin everything and this snack cake looks perfect! NOTHING about this is unfortunate – I’ll take a whole pan! This week – or next weekend is when I’ll finally crack my first can of the season and I’m so excited! Oh yum! I love the pumpkin + yogurt combo! I love snack cakes Cassie – so simple, but rarely disappointing. The combo of the pumpkin and yogurt must keep this crazy moist, can’t wait to give it a go! I’m super excited for Pumpkin season as well! I just came up with a Spiced Pumpkin Hard Cider recipe which was amazing, and now I want spiced pumpkin everything! Wish I had a piece of this right now! Looks delicious! I tried to make this yummy-looking cake today. But after more than 2 hours in the oven and even increasing the temp to 350, it is still basically raw inside. It started to burn on the top so I gave up. Any ideas what went wrong? I’d love to try again! Hi Sarah, I’m so sorry to hear this. The only thing that I could think of would be that your oven temperature might be a bit off? Also maybe the your flour could be old. You might also try baking it in a loaf pan instead of a square baker.